Image caption Carrie Lam says the "one country two systems" formula is "as robust as ever"
Carrie Lam thinks there is a place for her in heaven. "Because I do good things," she says. She tells me this with a straight face. In fact, the 60-year-old career civil servant is relentlessly serious during an interview conducted in the chief executive-elect's office, apart from the occasional nervous laugh, glance towards the door and complaint that my questions are unfair. To be fair to Mrs Lam, at least she has exposed herself to those questions, and even before taking office. Her predecessor CY Leung granted no BBC interview during five years in the post. Mrs Lam is a Roman Catholic. 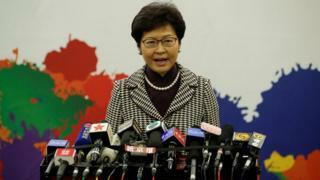 Perhaps it is a sense of duty which drove her to seek Hong Kong's top job. It certainly wasn't popularity. She lagged consistently behind her rival in public opinion polls during the campaign, dogged by allegations that she was remote and out of touch. She was finally elected on just 777 votes from an electoral committee dominated by pro-business and pro-Beijing figures. With only 0.1% of the public voting for her, I ask how she can claim a mandate to lead Hong Kong. "Well, I don't think it's a question of a number. The question is about legitimacy," Mrs Lam says. "And as you all know, the election committee by itself is formed from a much larger electorate representing broadly all the sectors in society in Hong Kong." But election committees are a sore point. In 2014, Hong Kong saw massive democracy protests precisely because protesters wanted the right to elect their leader without a committee screening the candidates. The so-called Umbrella Movement brought the heart of Hong Kong to a stop for nearly three months, but failed to move Beijing. Mrs Lam, like all her predecessors in the past 20 years, now struggles against the charge of being a Beijing puppet. "I know perception is important," she says, "but to say that I am just a puppet, that I won this election because of pro-Beijing forces, is a failure to acknowledge what I have done in Hong Kong over the last 36 years for the people of Hong Kong". But after half an hour spent with the chief executive-elect, it is hard for me to escape the conclusion that a key objective for Mrs Lam is precisely to avoid saying what will upset Beijing. 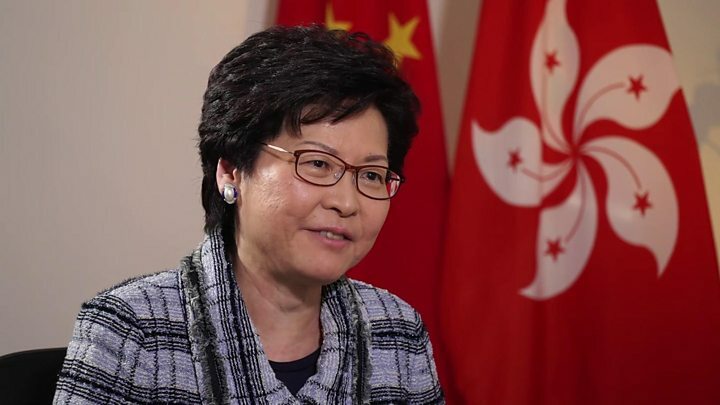 On 1 July she will be sworn in by Chinese President Xi Jinping and embark on the task of serving two masters: the people of Hong Kong and Beijing. Some say reconciling these masters is impossible. But after serving as CY Leung's deputy, Mrs Lam at least has experience of trying. And in the course of our interview, I conclude that one aspect of her technique is avoidance. Take the example of calls for independence. Mrs Lam will not confirm that such calls are protected under Hong Kong's right to free speech. "We will abide by the rule of law." More than that Mrs Lam is not prepared to say. No wonder. This is a very vexed question. Since the failure of the Umbrella Movement, some young "localists" have argued that if China will not permit democracy, the only way to get it for Hong Kong is through greater autonomy, self-determination or even independence. Beijing finds such talk intolerable. In other parts of China, it results in a lengthy jail term. And despite Hong Kong's guarantees of autonomy and freedom of speech, senior Chinese officials have described talk of independence here as a threat to national security. Mrs Lam refuses to get dragged into this debate, saying only: "I think Hong Kong is an inseparable part of the People's Republic of China." "You have to look at 'one country, two systems' as an integral whole. What is the purpose of two systems if it is not put in the context of one country?" She is similarly circumspect on another sensitive issue, the alleged abduction by mainland agents of Hong Kong booksellers in late 2015. On public concerns, Mrs Lam acknowledges that her job is to be the bridge between Hong Kong and Beijing. "If there are worries that there has been undue interference into Hong Kong affairs which should come under a high degree of autonomy, then the chief executive has to reflect those sentiments and speak up on behalf of people." The British government described the bookseller incident as a "serious breach" of the treaty governing Hong Kong's return to China in 1997. But Mrs Lam refuses to be drawn. Do we have the actual facts and evidence in front of us to prove beyond doubt that that was an act of interference, an act of the mainland authorities enforcing mainland laws in Hong Kong? Mrs Lam is impatient with the concerned chorus charting threats to Hong Kong's way of life. According to the last British governor of Hong Kong, Lord Patten, Beijing has been steadily tightening its grip on Hong Kong's windpipe. But the chief executive-elect tells me "one country, two systems" is "as robust as ever", and rule of law is "better than pre-1997". Twenty years after the reunification, the judiciary is operating very independently. There is one question on which Mrs Lam concedes the record is imperfect. "I'm a very honest and straightforward person, so I will confess that in recent years there has been a feeling of disconnect. Some people, especially young people, are feeling that they are not connected adequately with the government and with our own country. We need to do more in engaging young people." With only ten days to go before a Chinese president swears Mrs Lam into office as Hong Kong's new leader, and with protests planned to mark the occasion, she may soon get the measure of how big that disconnect is.